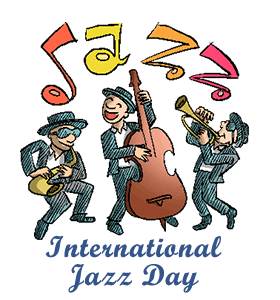 ﻿International Jazz Day: Calendar, History, Tweets, Facts, Quotes & Activities. International Jazz Day serves as a celebration of jazz music and its contribution to education, peace, unity, dialogue and cooperation. Jazz is a form of music that was born in New Orleans in the late 1800s and early 1900s. Since then, it has spread around the world and evolved into many different types of jazz music. International Jazz Day was designated by UNESCO in November of 2011 in an effort to highlight the role that jazz plays in uniting people from all over the world. It is celebrated annually on April 30th. Washington D.C. has been chosen as the International Jazz Day Global Host City for 2016. Paris, France, hosted the day in 2015. Nobody knows for sure where the word jazz originated. It is widely believed to come from the slang word jasm, though this is not confirmed. There are an estimated 33,000 jazz musicians in New York, which is considered a jazz music hub. Duke Ellington was one of these famous jazz musicians. Attend the international Jazz Day Global Concert in Washington DC. The concert features internationally renowned jazz musicians. It is also broadcasted across the US on ABC and streamed around the world by the UN and UNESCO. Watch a movie about jazz and music. Some suggestions are: Whiplash (2014), Jazz on a Summer’s Day (1959), Sweet and Lowdown (1999) and The Jazz Singer (1927). Donate to the Jazz Foundation of America. All funds donated are used to help preserve the interest of an art congress recently designated a rare and valuable national treasure. Spread awareness of social media by using the hashtags #jazzday, #jazz and #internationaljazzday. Visit one of many jazz museums or jazz concert halls in the US. There are many museums in the US located throughout the southern states up to New York.